Virginia lawmakers wrapped up this year's scandal-marked legislative session Sunday after passing a state budget that includes pay raises for teachers and state employees and significant new spending on public education. This year's session has been unlike any other in recent memory, with the state's top Democratic elected officials facing calls to resign. Gov. Ralph Northam and Attorney General Mark Herring acknowledged that they wore blackface in the 1980s, while Lt. Gov. Justin Fairfax has been accused by two women of sexual assault, which he denies. 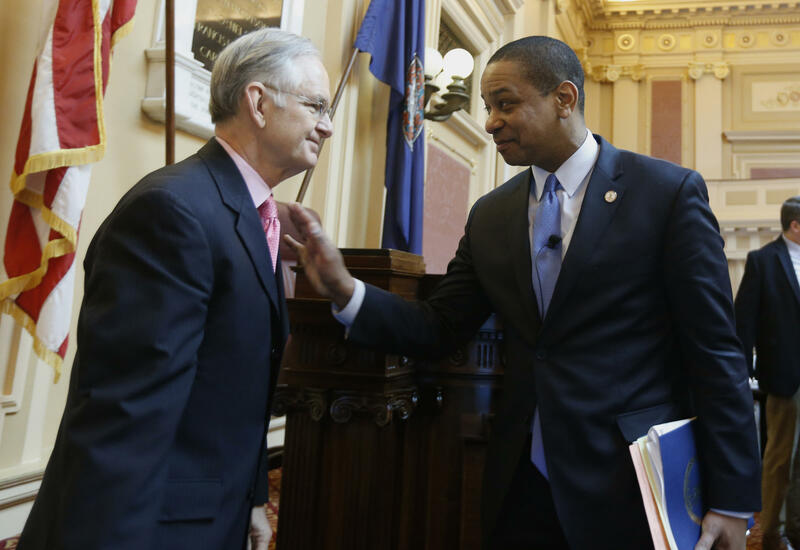 Fairfax gave a surprise speech Sunday just before the Senate adjourned in which he compared himself to Jim Crow-era lynchings victims. This year's session was already highly charged before the wave of scandals started at the beginning of February. All 140 legislative seats are up for grabs in November, and Democrats had high hopes of flipping control of both the House and the Senate as President Donald Trump has led suburban voters to flee the GOP in recent Virginia elections. But Republicans are counting on the recent scandals to help hold their narrow majority, as they portray themselves as the stable hand in a time of turmoil. "The General Assembly brought stable leadership and delivered results on the issues that matter most at a time when the Commonwealth needed it most," Republican House Speaker Kirk Cox said. Some notable legislation that passed this year includes a tax overhaul that will mean refunds of up to $220 for many taxpayers, a study on legalizing casinos and a measure requiring Dominion Energy to clean up coal ash pits. A key question looming over the session was what to do with a massive windfall in state taxes projected to be generated by changes in the federal tax code. A 2017 federal tax overhaul slashed tax rates but also put new limits how businesses can account for losses and what kind of deductions individuals can take — changes projected to boost state tax revenues. The GOP-led General Assembly balked at Democratic Gov. Ralph Northam's initial proposal to keep most of the money and spend it on areas he said the state has long neglected. Instead lawmakers decided to return the money to taxpayers by issuing refunds of up to $220 this year and increasing the state's standard deduction in future years. Lawmakers passed a budget that includes new money for many of the areas outlined by Northam, including pay raises for teachers. Northam said in a statement that he was "heartened that the budget reflects a number of our administration's priorities." Lawmakers balked at outright approval of proposed casinos in Bristol, Portsmouth, Norfolk, Danville and Richmond, but did approve a broad study of casinos and sports betting and are set to take up the issues again next year. Last year, lawmakers legalized slots-like betting machines at the Colonial Downs horse track and off-track betting parlors around the state. The race track pressed for a study, angering some lawmakers who backed casinos. "It's pretty rich that Colonial Downs is the one pushing so hard for a study when not only did we not study their issue last year, but they essentially hoodwinked the vast majority of the General Assembly," said Republican Del. Israel O'Quinn, who advocated for a casino in Bristol. Colonial Downs supporters said there were no attempts to mislead last year and the state is taking the right approach by studying the casino issues further. A heavily lobbied push to ratify the Equal Rights Amendment met with success in the Senate but was blocked by House Republicans. A plan to put tolls on I-81 to pay for improvements that had the backing of Northam and some Republican lawmakers fell apart in the face of opposition from the trucking industry and the Virginia Manufacturing Association. The General Assembly also approved legislation Friday to require Dominion Energy to recycle or store in lined landfills millions of cubic yards of coal ash currently located at sites around the state.